Siraj, who has been in splendid form, is the top wicket-taker of the Vijay Hazare one-day tournament, scalping 32 victims that included three five-wicket hauls. Mohammed Siraj will look to cement his place in the team when he plays in the tri-nation series in Sri Lanka. 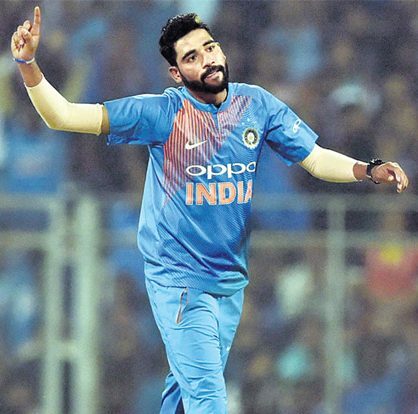 Hyderabad: With the MSK Prasad-headed selection committee deciding to rest some key players, including some fast bowlers, Hyderabad’s Mohammad Siraj was one of the automatic selections for the tri-nation T20 series in Sri Lanka. Siraj, who has been in splendid form, is the top wicket-taker of the Vijay Hazare one-day tournament, scalping 32 victims that included three five-wicket hauls. Siraj was happy that he is back in the Indian team after having missed the South African tour. “I was a little disappointed when I missed the South Africa series. I worked hard for a good outing in the Vijay Hazare tournament. I got into a good rhythm. I hit the right length. It made me feel good when I got three five-wicket hauls, including the two back-to-back five-for, in the one-day tournament. I knew that given my good performances, I should find a place in the Indian team,” he said. The fast bowler bowled at a good pace which even impressed Hyderabad coach J Arunkumar. “I think he was the best bowler in the tournament. He bowled at a good pace and even pitched up nicely to take good number of wickets. He is a much-improved and matured bowler,” said Arunkumar. With Bhuvneshwar Kumar and Jasprit Bumrah being rested for this tour, Siraj said it is a big challenge to be one of the main bowlers for the team. “I’m confident of a good performance in the series. It is a new challenge for me,” he said.